First POCO meter I've ever seen in danger of being hit with a weed wacker! Must be the land of Oz. Looks like power & control for the firehouse traffic control signal??? Why in the heck are you lurking around the streets of Huntsville, Alabama on Google Maps anyway Randy ? I have to fess up that I lurked around Google Earth to see that surrounding area. Guess it is the inquisitive nature of me. I detected an NEC service height violation! 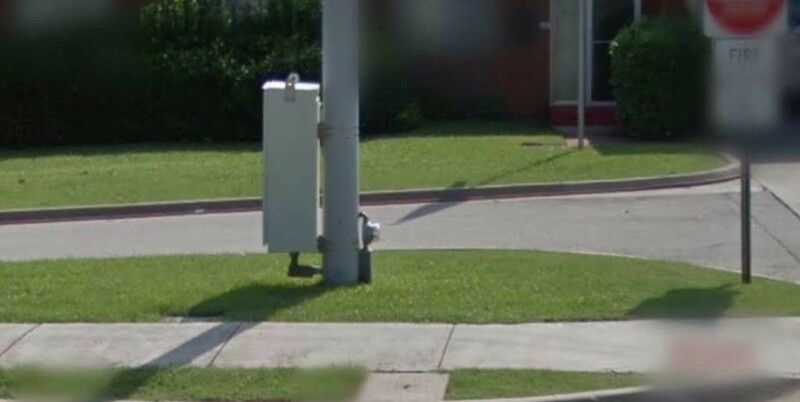 Actually someone posted a link about a ped signal at the intersection up the street and I just browsed over and saw this gem. Google Earth is a great work tool. I use it the regular view to look at roofs, where the A/C equipment is, and to get a general idea of the layout of the property. One tool is the ruler where you can get dimensions. Quite a few twp dept's use it regularly. Engineering, Zoning, Building Dept's, to name a few.